Mathias Jorgensen says Huddersfield must "figure out" a way of coping with Aaron Mooy’s enforced injury absence over the coming months. Former Manchester City midfielder Mooy has been ruled out until February with a medial collateral ligament tear to his right knee sustained during Huddersfield's 1-0 defeat at Arsenal last weekend. Jorgensen admits the Australia international - who can no longer play in his country's 2019 Asian Cup campaign - will be sorely missed, but is confident Huddersfield can find a solution as they look to cover the midfielder's absence. "It's a big blow, but we would have been without him for all of January [due to the Asian Cup] of course," the defender told Sky Sports News on a pre-Christmas visit to a local hospital. "He is, of course, one of our best players and we have got to figure out a way to deal with that. But we have played other games without Aaron last year, and this year without some of our stronger players, and we've coped well performance-wise." Club captain Tommy Smith, who is also out until the new year after suffering a torn hamstring against Arsenal, added: "Mooysie was just hitting good form and scored a couple of goals in the Wolves game recently. "He is an influential player for us, but with Aaron being injured it opens the door for someone else and I'm sure someone will step in and do a great job." Reflecting on his own injury, Smith said: "It's very frustrating. It's never nice to be injured, but it is part and parcel [of playing football]. "Hopefully, it will not be too long until I am back involved and fighting for my spot again. It was a small tear in my hamstring, which is unfortunate, but as I said these things happen and I'll come back fitter and stronger." 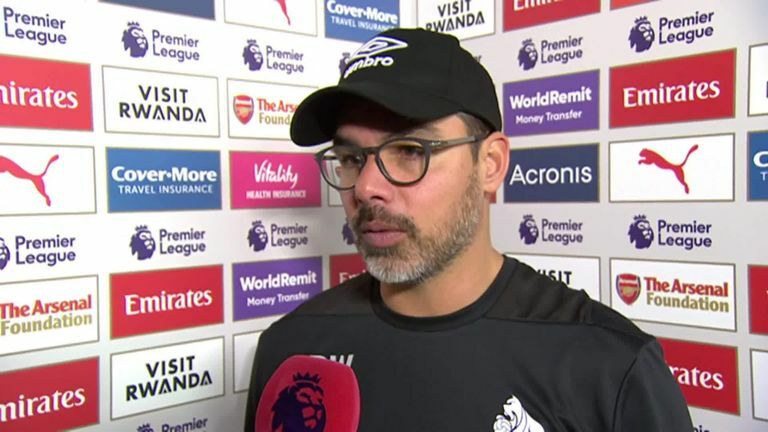 David Wagner said he was proud of the 'spirit' his Huddersfield side showed in their 1-0 loss at Arsenal. Members of Huddersfield's squad were visiting the children's ward at Calderdale Hospital. And Smith understands the importance and the difference the annual visit can make for children receiving treatment at the hospital at this time of year. "It's tough. It's an eye-opener," he said. "I have been doing this with this club for a few years now, so it's always a special time to come here and see the kids, and put a smile on their faces. "We know how hard it can be and everyone at the club is hoping the kids can pull through, have a good Christmas and ultimately we try and put a smile on the kid's faces."